BERNINA's first long arm quilting machine features a full 24" of quilting space from the needle to the back of the machine. 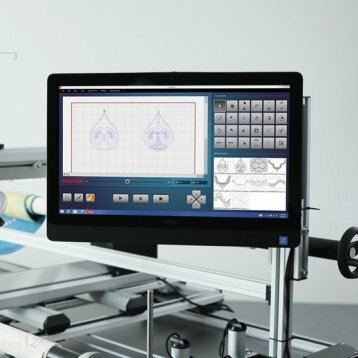 The unique threading path, thread stand, handwheel, and machine controls are all located at the front of the machine-right where you need them. Master hand-guided quilting quickly with the assistance of the integrated BERNINA Stitch Regulator. The BERNINA Longarm Stitch Regulator is simple to activate and simple to customize using the machine’s touch screen. Set the stitch length as preferred for a variety of quilting styles. The BERNINA Longarm Stitch Regulator keeps the stitch length consistent even at variable stitching speeds. Choose between three stitch regulation modes, including a basting mode or a fully manual mode. The unique and fully articulating handles can be moved to just the right position for all of your quilting needs. Whether stitching edge-to-edge, custom motifs or ruler work the handles can be adjusted for visibility and comfort. Program each of the buttons on each handle to keep frequently used functions at your fingertips. Edge-to-edge /pantograph style quilt designs can be easily guided with the optional rear handle system and screen. With 2,200 stitches per minute for hand-guided quilting, you will complete more quilts more quickly than ever. 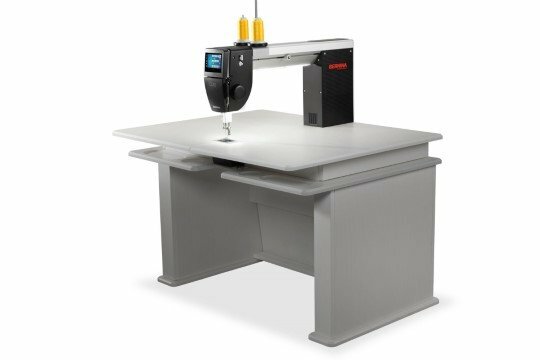 The BERNINA Q 20 comes standard as a sit down model machine with a 20" throat space and it can be upgraded to a frame model machine. The generous freearm depth and height provides ample space for managing your larger quilts. The forward position of the thread stand is easy to reach and the threading path simple to follow. The integrated bobbin winder is just one of the small details that make this machine unique. The BERNINA longarm models offer the industry’s only presser foot tension release for threading ease. The exclusive tension system features numeric tension settings making it very easy to use a variety of thread types with success. The BERNINA Q-matic system is automated quilting in just a few simple steps. Easy quilting, whether stitching out simple edge-to-edge designs or intricate custom patterns. It includes over 250 designs from several renowned European and US Designers, including: Lisa H. Calle, Keryn Emmerson, Amanda Murphy, Tula Pink, Patrizia Ritter, Linzi Upton and Sarah Vedeler and more than 350 additional designs included with Art & Stitch. There are multiple on-demand help functions for assistance in every step of creating and placing your quilting design. A 21.5” all-in-one touch PC mounted to the side of the frame guarantees comfortable access to all designing and placement features. For ease-of-use, additional sewhead interaction screens allow control of design stitch-out and placement directly with the sewhead. Returning to the main screen is not necessary making your quilting highly efficient. 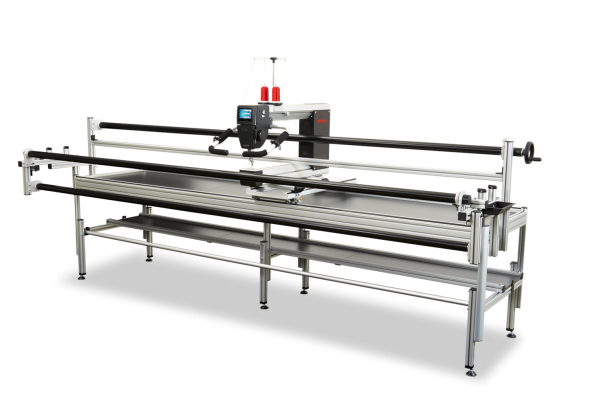 With one-touch quick belt release system, it is an easy switch from automated to freehand quilting and due to the side mounted PC and the one-touch quick belt release system, the Q Series machine remains lightweight and maneuverable.